Pachytheca, a mm-size sphere which lived in the Silurian and Lower Devonian and would not readily fit into any scheme, has recently been assigned to the nematophytes and, together with all nematophytes, put under the heading Enigmatic Organisms in . (This view is adopted here although Pachytheca is still regarded as some strange type of alga by others.) It stands out amongst nematophytes as it is the only one with spherical shape. Specimens are found as coalified brittle fossils at several locations [2,3], usually as glossy black spheres. If broken or cut into halves they show a thick spherical shell of radially arranged tubes. A cut along a central plane of the silicified specimen presented here is shown in Rhynie Chert News 1. 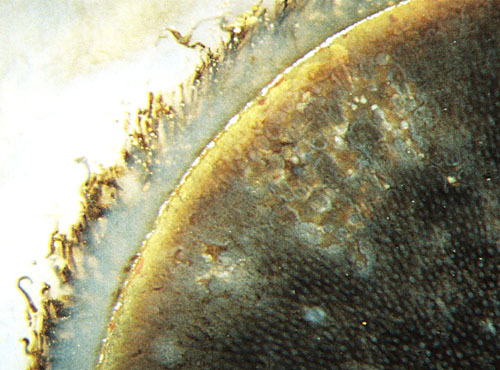 Apparently, Pachytheca has never been pictured such that the radial tubes are seen in cross-section as in Fig.1. 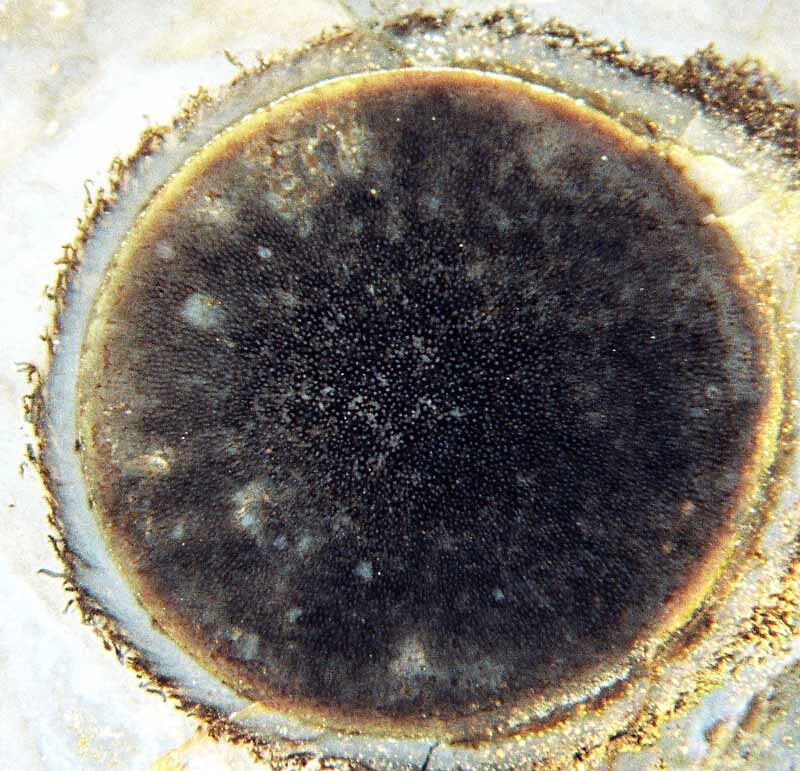 Fig.1: Pachytheca in Rhynie chert, view on a cut face positioned 1.4mm off the centre of this spherical organism. Hence, the tubes appear as cross-sections in the middle of the circle and as inclined sections elsewhere The centre of the sphere is above the picture plane so that one looks from inside the sphere towards the cap. Diameter of the cap 2.5mm. The tubes form an essentially close-packed arrangement. The interior of the tubes, seen as light-coloured dots, appears rather narrow while the tube walls appear rather thick in the central region, which probably is an artifact due to preservation and/or imaging. As observed earlier, approaching cracks do not enter but become deflected such that they separate the sphere from the surrounding matrix. There are other features worth considering: damaged areas inside and a conspicuous coating around the sphere with a filamentous structure of rugged aspect. Fig.2 (right): Pachytheca with areas of damage affecting both the tubes and the gel; detail of Fig.1. The spherical surface of the cap meets the picture plane at an acute angle. The incident light is reflected at the crack separating the sphere from the surrounding matrix, which makes the light-coloured margin of the circular section seen here. The damage bears superficial similarity with wood decay known as pocket rot. Without more detailed investigations with higher magnification, the cause of the rot is obscure. What seems to be sure is that the rot is not restricted to either the tubes or the gel between the tubes, and it does not preferably spread along the tubes. Concerning the coating around the sphere, it seems that an interpretation as a microbial layer with peculiar outgrowths can be excluded since a slight tendency towards an alignment of the tangled filaments can be observed in some places. It seems to be a sheath somehow related to Pachytheca, which is all the more interesting as it adds another enigma to this still poorly understood fossil. See Rhynie Chert News 44. H.-J. Weiss 2010, slightly modified in 2012.